Helping you cut a dash into 2017, we’ve compiled a list of the five suits we think every man needs. These staples will arm your wardrobe for all occasions and seasons, taking you through this year and into the next (if you also follow our suit care guide). 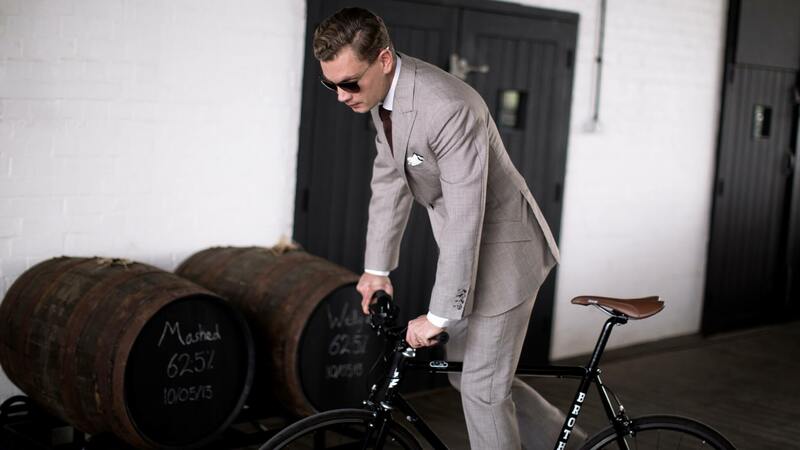 This two piece suit is a simple design classic. Wear it for almost every occasion, from the office to social gatherings. Add a waistcoat for a more versatile look. Features: Jacket – 2 button, 4 kissing cuff buttons, notch lapel, side vents, straight flap pockets. Trousers – belt hoops, no turn-ups, no pleats, straight cut trousers. A pin stripe suit is another hugely popular choice. Favoured by City workers for many years it can now be seen in offices throughout the country and across the globe. The stripes in the suit fabric lend an air of formality and elongate the look of the wearer’s body. Fabric: Navy blue pinstripe 100% English wool, with contrast coloured plain lining. 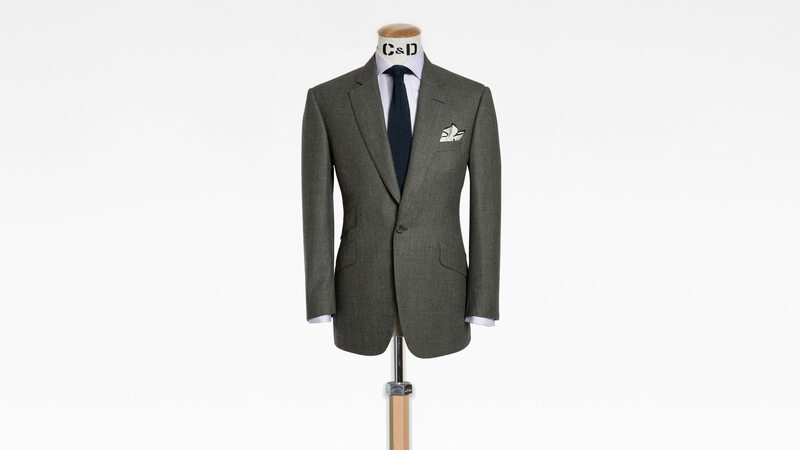 Features: Jacket – 3 button, 4 working cuff buttons, peak lapel, side vents, cutaway pockets & ticket pocket. Trousers – side adjusters, no turn-ups, no pleats, taper cut trousers. Summer suits are rapidly becoming a staple of every man’s wardrobe. Whether thanks to global warming, or the heat of the London tube, or the cosmopolitan influence from our overseas friends – whatever the reason, light in weight and colour, the summer tailored suit is here to stay. Fabric: Mid grey herringbone 100% English wool with a light blue lining. Features: Jacket – 1 button, 4 working cuff buttons, notch lapel, centre vent, cutaway pockets, ticket pocket. Trousers – side adjusters, no turn-ups, one pleat, straight cut trousers. Winter suits are made from heavier cloth than their summer counterparts. This helps increase the suits longevity, representing a wise investment when adding to any wardrobe. 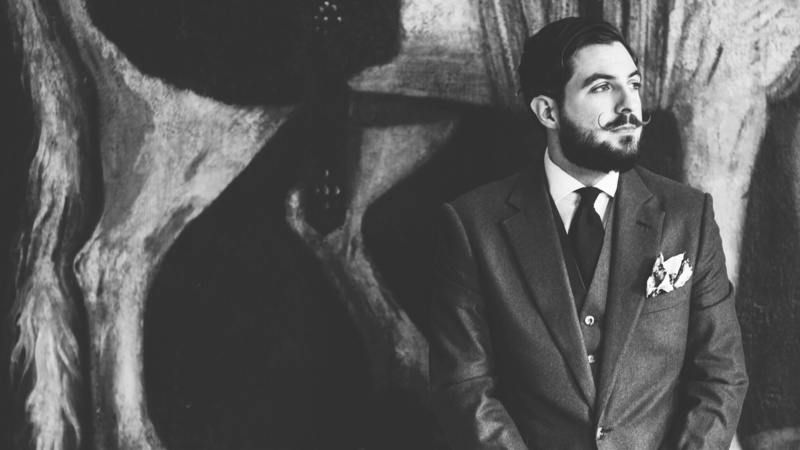 Tailored suits like these, with the correct care and attention, last for many years. The addition of a waistcoat allows for layering to adjust to temperatures both inside and out. Fabric: Black worsted 100% English wool, with rich dark lining in jewel like colours – purple, green, burgundy. Features: Jacket – 2 button, 4 working cuff buttons, notch lapel, centre vent, cutaway pockets. The old conundrum of what to wear to a wedding if you are not wearing a morning coat, need be a problem no longer. The wedding suit is a timeless choice, befitting any male wedding guest, with classic English tailored lines. This tailored suit is perfect for formal occasions. Fabric: Light grey puppy tooth 100% English wool, with contrast light grey/silver lining. Features: Jacket – 2 Button, 4 kissing cuff buttons, peak lapel, side vents, cutaway pockets. Trousers – belt hoops, no turn-ups, no pleats, taper cut trousers. A few extra details for those that are interested…. Lapels – the collar of a jacket, of which there are three main style choices. 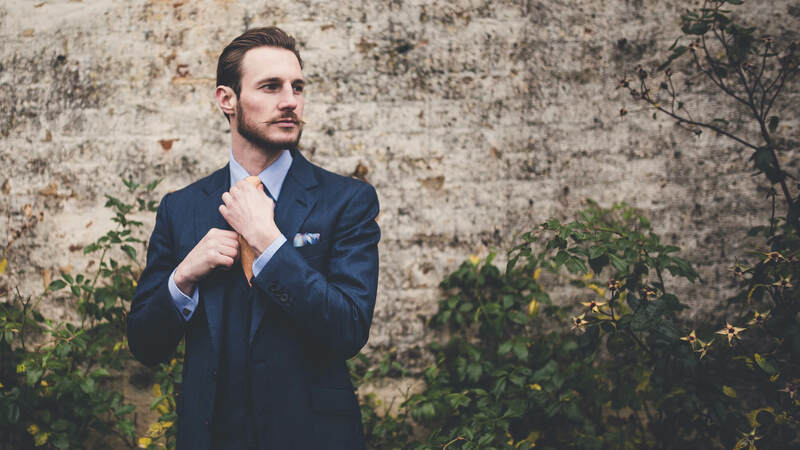 Notch lapel – the most common form of suit collar categorised by the notch type cut of the fabric. Peak Lapel – a more formal lapel most often seemed on double breasted jackets. Shawl Lapel – used in some instances of a dinner jacket. Vents – this refers to the bottom back of the jacket, where one chooses whether or not to have the jacket made with ‘cuts’. Side vents – two cuts are made on either side of the jacket, allowing greater flexibility for the wearer. Centre vents – a centre cut in the fabric, most often seen on sports jackets. No vents – no incision is made into the fabric. Cut-away pockets – this refers to where the pocket is cut away at an angle. Straight cut pockets – this is where a pocket is cut straight. Ticket pocket – a small pocket that sits above the standard jacket pocket, normally on the right-hand side. Breast pocket – this is a pocket that sits on the upper left section of a jacket, rarely used except for a handkerchief. Working buttons – this is where the buttons can be undone an unusual feature in an off the peg suit but one that nevertheless offers greater flexibility to the wearer. Kissing buttons – kissing buttons refers to buttons on the cuff that slightly overlap or touch- hence the name. Pleats – a gathering of fabric just below the waistband on the front of the trouser. There may be one, two, three, or no pleats, which may face either direction. When opening toward the pocket they are known as reverse pleats and when they open towards the zip, they are known as a forward pleat. Side Adjusters – a metal loop with a cloth tab, attached to the outside of the trouser waistband, one on each side, used to adjust the waist size of the trouser. Belt Hoops – a loop through which a belt is threaded. Turn Ups – where the trousers fabric is turned up at the hem of the trouser to create a cuff. 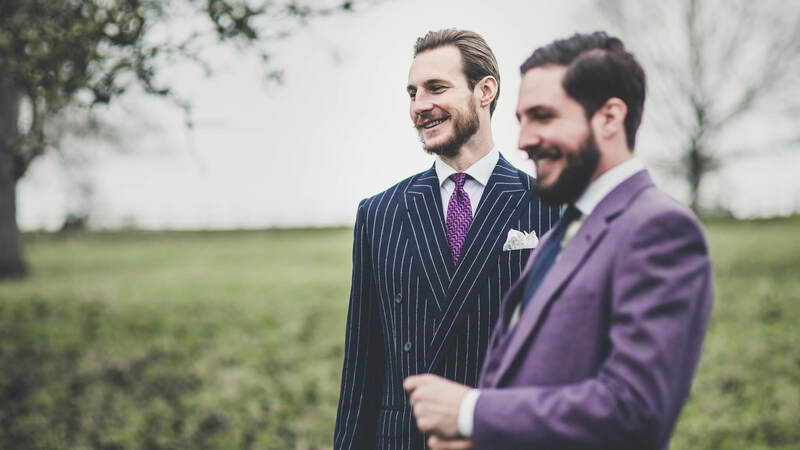 Book a consultation with one of our tailoring consultants.